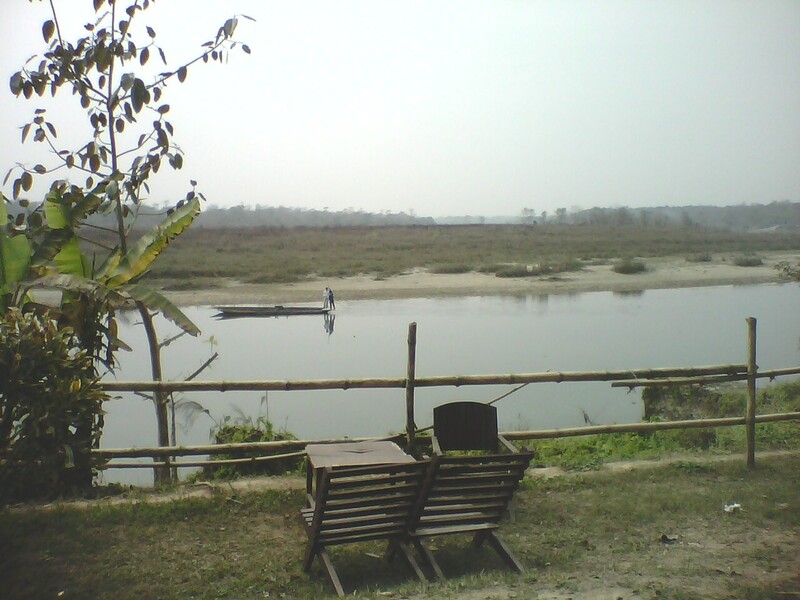 View of the river in Chitwan area. This was at our 400 NRs. guest house. Everyone kept telling me to go to Chitwan. Maybe they were just tying to get rid of me, but I finally went. Genae went with me and I have to admit that I did enjoy myself. It was very nice and quite a bit different from Kathmandu. Since this trip I've made a coupled of decisions. I am going to write shorter blog posts, and write more posts. Blogspot errors when I try to save or publish the post, so I think keeping posts smaller will be less frustrating. I hadn't been out of the valley very much since I arrived over two years ago. Yet, in my eBook, Nepal: A Tourist's Manual, I wrote a transportation chapter and tried to cut some of the errors out of traveling for my readers. This was a test as to my research. I knew there was another way to get out of the Valley without getting up and to the bus at 6:30 am, but I didn't really know how. I wanted to find out and actually wasted a couple of days trying to get the information. After it didn't come, I decided to just do it. We did. This is the kind of bus you would expect to ride in if you take a 'tourist bus.' They are comfortable with reclining seats and no one standing in the isle, carrying goats or riding on top. We stopped about half way through the trip at a very nice and clean restaurant with a nice buffet. First, you do not need anyone to book your ticket the day before. This can be done at any trekking/travel office for the same price before the day of your trip or you can go to the bus office in the morning that you want to travel. Obviously, if you come at high season or during a major Hindu pilgrimage you will need to book in advance, for sure. The bus office is located across from the Garden of Dreams (not the same as the street where the buses are parked). It will cost the same if you book direct or from an agent-unless he cheats you. The price of a tourist bus ticket is very small. You will need to get a taxi or walk to the intersection by the Garden of Dreams in Kantipath before 6:30 am. If you want to avoid a taxi so early in the morning you can stay at some very inexpensive guest houses in Jamal or you can walk from Thamel if you don't have a lot of luggage. There is a small street across from the NIC building that would be a short walk to the bus park. I had no idea where they would put buses, but they were easy to spot all lined up in front of the old US Embassy. Always get a 'tourist bus' rather than a 'local bus.' Local buses are no fun at all. They break down a lot and stop along the road instead of at proper toilets and they can take twice as long to get to your destination and you will spend less than $10 on most trips to just about any destination in Nepal. Of course there aren't necessarily tourist buses going to all points, so sometimes a local bus is the only way to get there. But, if given a choice, always pay the $2-3 extra for the tourist bus. A lot of people book tours from Kathmandu or online. The prices start at around $100 for a two night package. We opted to do our Chitwan adventure on our own. We took our time and stayed almost a week and still spent less than $300 for the two of us. 1. Binoculars: We were unable to find a place to rent or buy them in the Chitwan area. After we got back to Kathmandu we found some for 1,200 NRs. at the Bishal Bazzar complex at New Road. 2. Electric pot and supplies to make coffee: We didn't bring cups, but instead used them from the guest houses. We experienced load shed on a few early mornings, but really enjoyed waking up to our own hot coffee. It wasn't just about saving money. It is difficult to get real coffee in many places in Nepal. It was easier to get real coffee in Chitwan, but found that it wasn't always available. 3. Get all the money you will need in Kathmandu before you leave for your trip. The towns are very spread out in the Chitwan area. I did see a few ATMs that I do not believe would charge you, but it would be a wasted morning to find one. 4. If you are reading this from abroad, purchase an electronic mosquito repellent to wear around your neck. During most of the year there can be a mosquito problem in the Chitwan area. You might also want to purchase some natural rub on products or Avon's Skin-so-soft. These pony carts made travel a breeze. Labels: Birding in Nepal, getting the most out of Chitwan Nepal, save money in Chitwan, should I buy a package for Chitwan? I have started following your Nepal blog as I might come to the beautiful mountain country with my family (not confirmed yet) this year and this is so helpful..